Aidan Turner to play a psychotic Irish terrorist. 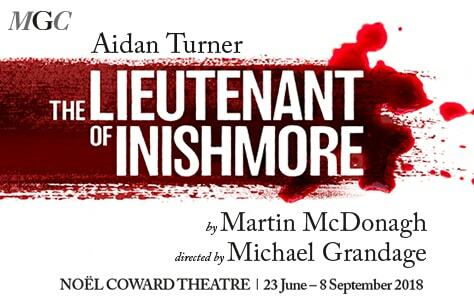 MGC Artistic Director Michael Grandage directs the West End revival of Martin McDonagh's critically acclaimed, brilliant satire on terrorism, The Lieutenant of Inishmore. Aidan Turner, star of stage and screen, best known for his role in Poldark, will play Mad Padraic, a terrorist who is deemed too violent to be a member of the IRA, in this very hilarious, and somewhat acute observation of violence in contemporary culture. This production follows Michael Grandage's award-winning production of McDonagh's The Cripple of Inishmaan in 2013. Recommended for ages 16 and above. All persons entering the theatre, regardless of age, must have a ticket. Late comers will NOT be admitted. The performance on Thursday 30th August, 7.30PM will be filmed. All persons aged under 16 must be accompanied and sat next to the accompanying adult. They may not sit on their own within the auditorium. If children do have separate seats, entry could be refused. This play was hilarious. The whole of theatre was in stiches. Aidan Turner was fantastic. My husband and I thoroughly enjoyed the play and our visit to the Noël Cowerd Theatre. We thought that all the cast were excellent and would recommend the play to everyone (perhaps not the squeamish though!) Great job - thank you! !